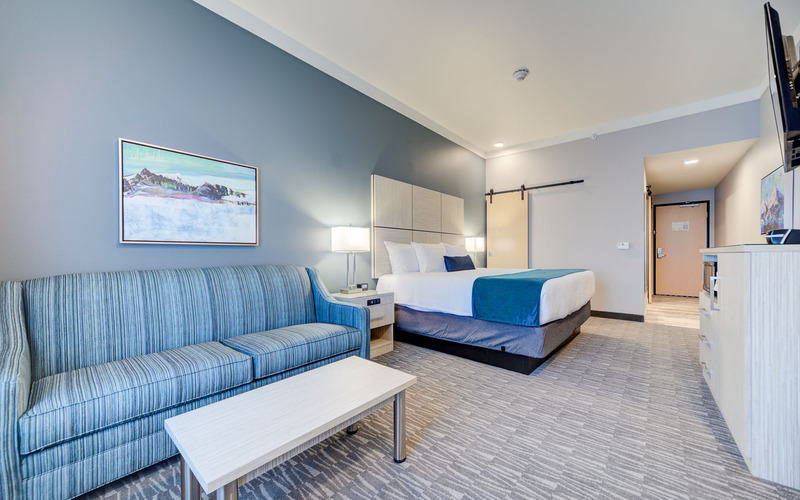 Choose from Best Western Premier Peppertree Inn at Bend's collection of sleek, modern guest rooms and suites, including many with fireplaces, balconies, and sleeper sofas. 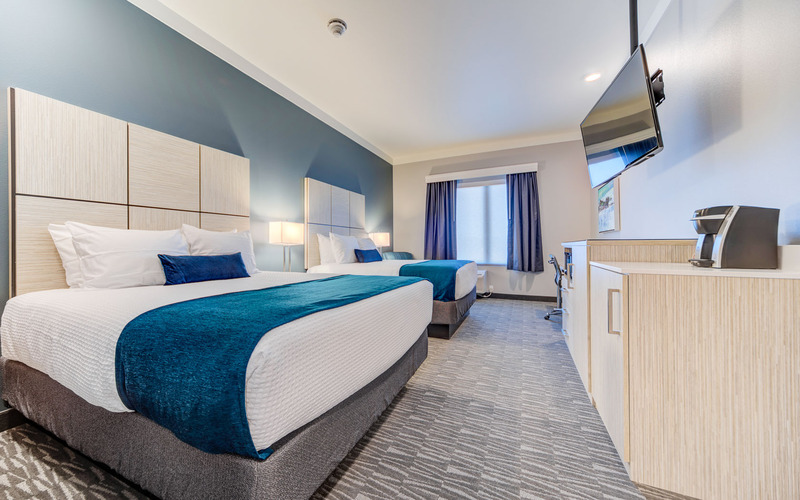 After a busy day around town, relax and recharge in an oversized retreat featuring beautiful mountain and city skyline views, warm wood headboards, and thoughtful amenities that make it easy to bring your four-legged friends along. 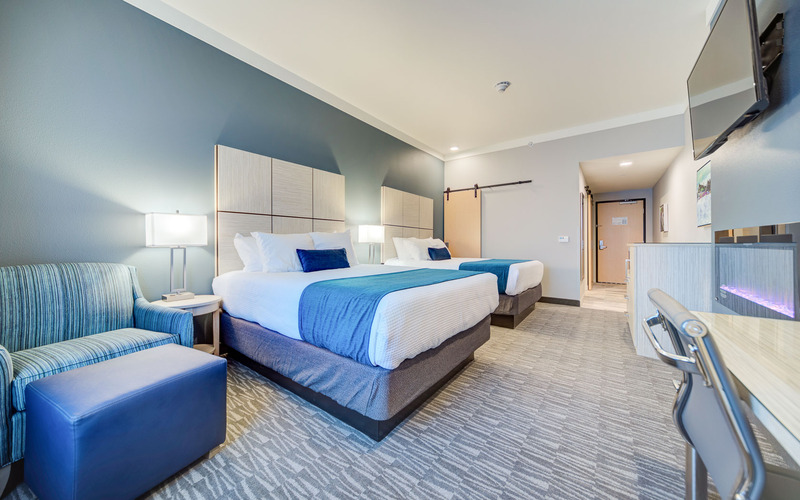 A perfect choice for family or friends traveling to Bend, this modern, comfortable room equipped with a microwave, refrigerator and Keurig coffee station, is all you need to feel right at home. You can’t get cozier than this. A warm, inviting fireplace is at the center of this lofty room with two queen beds, premium linens, deluxe bath amenities as well as a microwave, refrigerator and Keurig coffee station. This is your sanctuary in Bend. 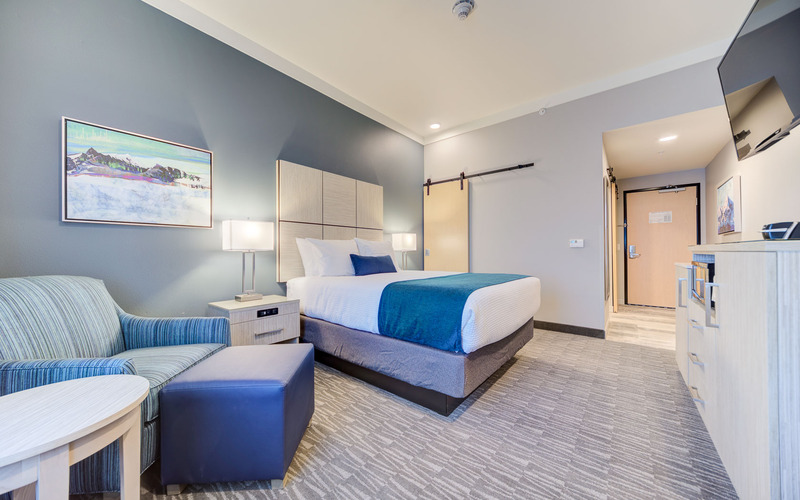 In addition to the side chair that offers additional seating in this spacious room, a microwave, refrigerator and Keurig coffee station are included for your convenience during your stay. A fireplace, a luxurious king bed, and a sofa sleeper too! There’s no end to the amazing amenities this room offers including a microwave, refrigerator and a Keurig coffee station. 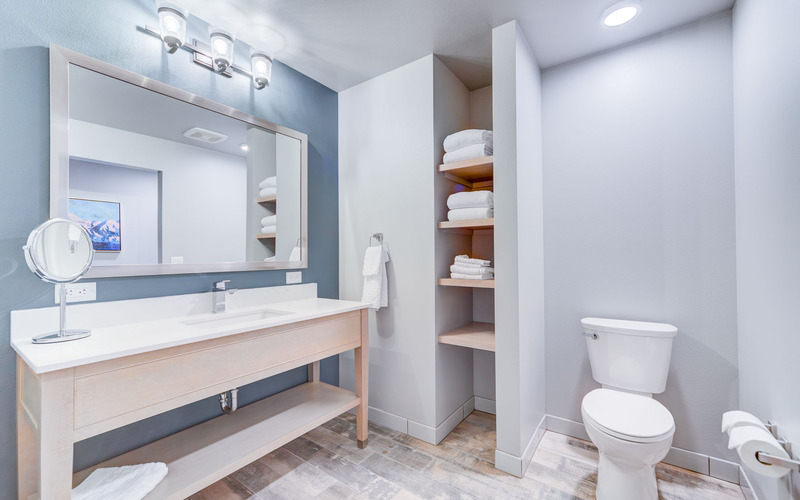 This queen room is a part of our brand new build in Bend. 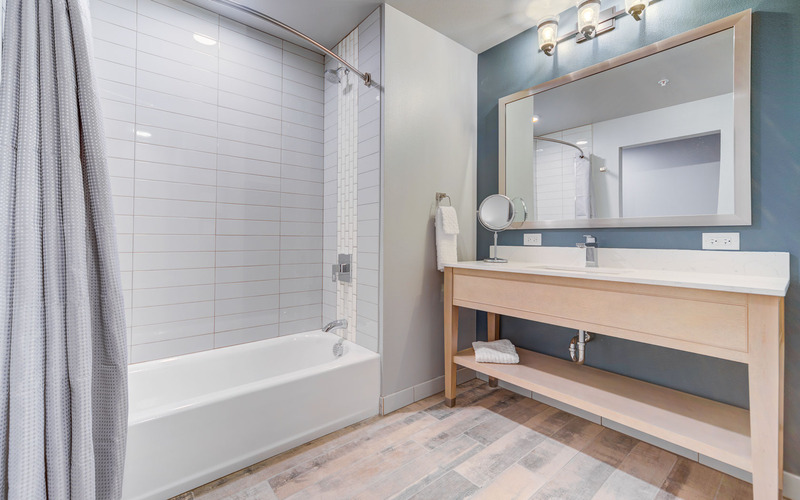 Modern, and packed with everything you need including a generous soaking tub to warm up after outdoor activities. Enjoy this ample room, big king bed and a sofa sleeper as a bonus. Small families or groups of friends traveling together will love this space with a microwave, refrigerator and Keurig coffee station at their fingertips. A fireplace lights up this modern, over-sized suite with a king bed, two queens, and a side chair. 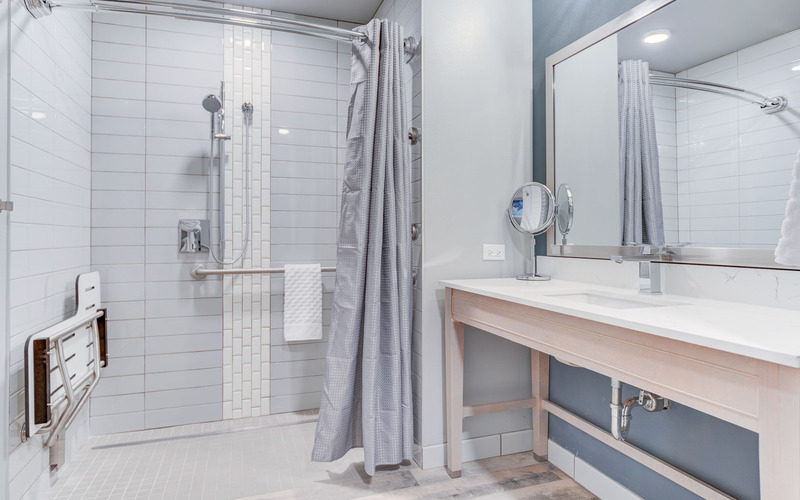 You’ll have premium linens, plush towels, as well as a a microwave, refrigerator and Keurig coffee station. 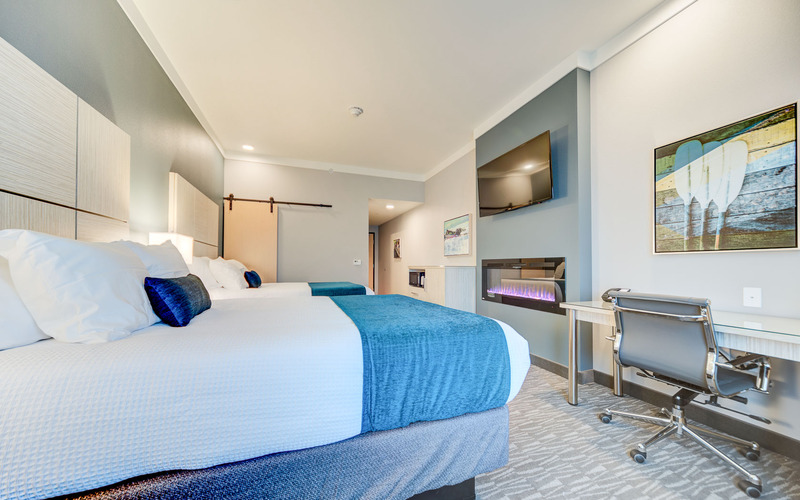 There’s nothing better than an in-room fireplace to set the perfect tone for your Bend vacation. This queen suite with an extra-large twin bed, and sofa sleeper can accommodate five people comfortably. Bonus: A balcony with exquisite views. A lovely fireplace is at the center of this queen suite with two queen beds and a side chair. Complimentary Wi-Fi, HD TVs, and premium linens elevate your stay from fine to fabulous. This king room with sleeper sofa is convenient for family and friends traveling together who may have additional needs. Our friendly staff can help you with any other requests. 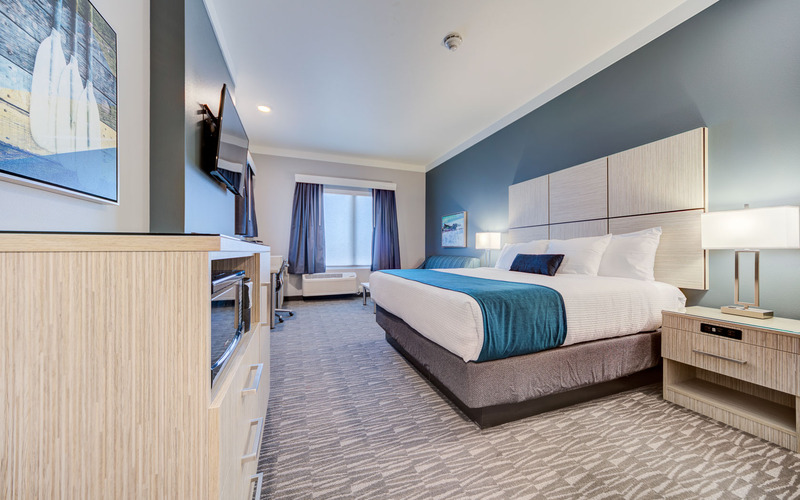 As comfortable as home, more splendid than you imagined, this ADA suite is outfitted with a queen bed and a sofa sleeper. The fireplace is the warm heart of the room. Step outside to see the views from your balcony.